Emerging from winter in the north is a lot like those old movies when the last straggling remnants of civilization emerge from underground bunkers months after the nuclear holocaust. Survivors blink in the daylight their eyes now unaccustomed and they take timid breaths not confident the air is safe. They look about, shocked at the devastation, take stock of what is left, what might be salvaged, what might still be alive. Similarly, we northern dwellers shield our eyes from the spring sunlight and cautiously sniff the air, but mostly we look at our drained bank accounts and try to assess what is left after months of sky-high utility bills have bled us dry. Let's face it… the utility companies are energy monopolists, and like street-corner gangsters they demand protection money. They parcel out warmth and artificial light in exchange for an ever-increasing share of our cash, and the implied threat is discomfort or death if we fail to pay up. So, we pay… and we pay… and we pay. The game is rigged, of course. There is no way to beat them. But we can fight back… lessen the damage… and keep a little more of our hard-earned money. Remember, every dollar we save on electricity is a dollar we can spend on wood! The best weapon we have in the fight against the energy czars is knowledge. If we know how and where our energy is being consumed, we can take steps to cut our costs. An inexpensive tool that can help is the Kill A Watt P4400 from P3 International Corporation. The P4400 is their least expensive of three models, and at less than $20 will pay for itself in a very short period of time. The pricier models have more features, but with a calculator and a little ingenuity, woodworkers won't need those extras. 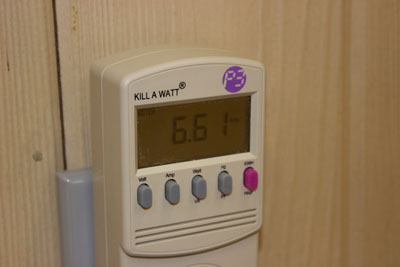 The Kill A Watt unit is very simple. Plug the unit into an outlet, then plug the device you want to measure into the Kill A Watt. The unit will provide readout of line voltage, amperage, and more… but the most exciting information is available with the push of the hot pink fifth button on the right hand side of the unit, labeled "kWh/Hour." While the Kill A Watt unit is plugged in and a device or tool is plugged into it, the unit will cumulatively track kilowatt consumption over time. My forgetfulness is costing me only one and one-third cents per month when I leave this new lithium charger plugged in without a battery. I guess I can afford that. By the way, you can substitute any time period for the 720 hours, but you must use "hours" in the formula… for example, if you want to figure out the cost to run a device for a week, use 168 instead, the number of hours in a week (24 X 7 = 168). If you want to know how much a device costs for a whole year, 24 hours X 365 days, or 8,760 hours would be the number you would use in the formula. If you want to know what a device costs to run for an hour, just insert a "1" in the formula. Next I tested an old nickel cadmium battery charger. The batteries don't hold a charge for long, charging takes longer, and as a result, I am even more prone to leave this charger plugged in without a battery for extended periods of time. This charger used 0.05 kWh over a 67-hour period. Okay, seven and a half cents a month is still not into "break the bank" territory, but the experiment did demonstrate that newer technologies are more energy efficient. We might also surmise that the cumulative impact of a few thousand woodworkers leaving unused battery chargers plugged in could have a real impact. Next I tested an innocuous little household style air purifier that I leave running 24/7 in the shop. I figure the more air I circulate through a carbon and HEPA filter, the cleaner my air will be. I was shocked, though, to find that this little air purifier is costing me $2.11/month to run. Just turning this air purifier off this year will pay for a sheet of cabinet grade 1/2" plywood. Still, there are bigger fish to fry. You have probably seen the advertisements for the "breakthrough" quartz and ceramic high efficiency heaters that claim to be able to heat 1,000 square feet for just pennies a day. I fell for the hype and use one in the mornings just for a quick heat boost when I first go into the shop. That "pennies a day" claim must be based on electricity that is a lot cheaper than mine. Every hour that heater is burning up $0.185 of electricity. On some brutally cold days this winter, I left this heater on all day, at a cost of almost $4.50/day. If I left it on for a whole month, it would cost $133 to run that "pennies a day" heater. That's a lot of pennies. All the fluorescent light fixtures in my shop are controlled in three zones via three light switches, but each light can be turned off individually as well. I never do, but should I? There are days when I spend almost the entire day at my workbench. The lighting zone that covers the bench also includes a couple of light fixtures that are adjacent but not directly over the work surface. Would it be worth turning off a couple of those? It turns out that each individual fluorescent light fixture is costing me only $0.009/hour to run. There are a total of 14 of these fixtures. If I have all the lights on, 9 hours per day, 20 days per month, my lighting costs alone are $22.68/month. Turning off just one would save me only 8¢ per day. I like the extra light. Still though, out of habit and a heightened sense of frugality, I turn off all the lights when I leave for lunch, to run a few errands, or chat with a neighbor… after all, all those lights together are costing me 12.6¢/hour. By now you are probably getting the picture how just having the knowledge of how much devices are costing to run may help you better control those costs. You may want to reconsider leaving that big ceiling-mounted air cleaner running all night. It won't be enough money to fund an early retirement, but why give the power company those extra pennies wasted when we leave battery chargers plugged in and extra lights on for no reason? I was motivated enough by the knowledge I was gaining to go in the house and check the light in the living room we leave on for security, the computer I never put to sleep, and the television we leave on "just for a little background noise." Between house and shop I have found almost $50 in monthly savings. 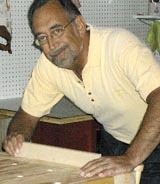 I have also learned a little more about my tools and my work habits. Perhaps you have read or heard that long or undersized extension cords can reduce power to machinery. They can. And I have also learned that looks can be deceiving. On occasion I need an extension cord, and if it will reach, I usually opt for the big thick black one with the little LED light in the female receptacle (which is, ostensibly, to show that the extension cord has power, or perhaps to help you find it in a really dimly lit work area). It is only 20 feet long, and I would have thought it offered little electrical resistance, but the voltage at the wall outlet measures a consistent 118.2 volts and at the end of that cord it measured only 117.8. My less "manly" looking orange cord, fifty feet long, demonstrated no line loss whatsoever, measuring the same 118.2 volts at the end of the cord. I am no expert in things electrical, but am vaguely familiar with the triangular relationship between volts, amps, and watts. If a motor is rated for 120 volts and 6 amps, it will draw 720 watts of power. If you reduce the voltage, the amperage will increase while maintaining roughly the same wattage (power) draw. It is this increased amperage that can result in additional heat that may damage a motor. As you can see, the more the line voltage drops, the more the amperage (and potentially heat) can increase. Along the way, as the voltage drops and the amperage increases, there will be a reduction in power. With my contractor-style table saw plugged into the Kill A Watt unit and that plugged directly into the wall, the saw motor with no load was drawing 6.61 amps. 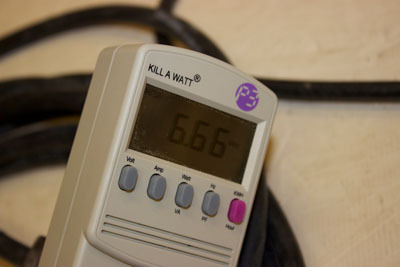 With the extension cord, the amperage increased to 6.66. 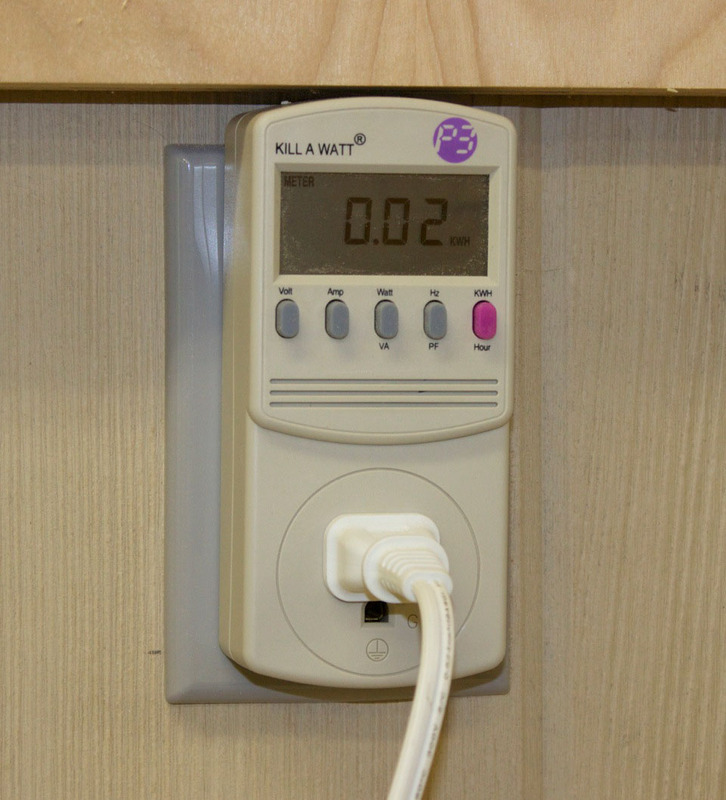 The Kill A Watt unit allows you to perform a number of electrical checks, including various measurements of the quality of electrical power in your shop. It is also possible to compare "no-load" and "with-load" current draw for machinery. Remember, if you intend to check a piece of equipment "under load," never… never… take your eye off the ball! Get someone else to watch the Kill A Watt meter while you watch what you are doing! Feeding a big piece of oak into your table saw while watching an electrical meter would be pure folly.